Here is some good news for at least one of my clients. 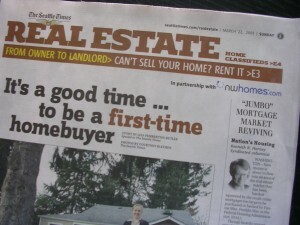 In Sundays’ “Seattle Times“, real estate columnist Kenneth Harney wrote an article called “‘Jumbo’ Mortgage Market Reviving”. Harney writes that Bank of America is entering into the very under-served Jumbo Home loan market this spring. This will really help the Seattle / Bellevue real estate markets, which have high median home prices. The median home price in King County for both single family homes and condos for Feb. 2009 was $348,000 (Feb. 2008 was $395,000, down 11.9% courtesy of the NWMLS). Jumbo loans are loans above the Conventional loan limit of $506,000, and we have been waiting for that limit to rise again to $567,500. Christi Meats from Evergreen Home Loans sent me an email last night to let me know that “We expect in the next week or 2 to see Fannie Mae and Freddie Mac sort out the final details for the increased loans amounts for Conventional loans from $506,000 to $567,500”. Christi also let me know that she will have more Jumbo loans available from B of A too, since Evergreen Home Loans; ” will be participating in this when it happens through our correspondent relationship with Countrywide.” Countrywide is part of B of A and according to Harney in the article, Countrywide will be changing it’s name to Bank of America Home Loans. The availability of Jumbo loans for high-end home-buyers began to contract in August 2007, so this is Good News! This entry was posted on Tuesday, March 24th, 2009 at 8:07 pm	and is filed under Christi Meats @ Evergreen Home Loans, Mortgages and Home Loans, Seattle Times RE articles. You can follow any responses to this entry through the RSS 2.0 feed. Both comments and pings are currently closed. There are certainly a lot of things to take into consideration. To think, I was confused a minute ago. Thanks for writing this. Incredibly helpful info. challenging on sites I stumbleupon on a daily basis. It’s always interesting to read articles from other writers and practice a little something from their web sites. What’s up, good site you have got in here.